Looking back to the golden age of mapping, this political wall map of Europe, has the look of an antique style map, but it is up-to-date. Perfect for the office or home. 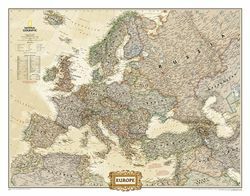 Europe wall map available in 3 sizes. The largest size is a 3-piece Europe Map Mural measuring 98 x 76 inches (that's about 8 by 6 feet) making it the biggest Europe map we have seen!! It is only available in paper and it comes with instructions on how to wallpaper the map on the wall if you choose to.